Once again, Friday has coming hurtling up and it's time to do a Five Favourite Friday post, this week about 'Things To Do In Shrewsbury'. Apologies for not getting this published last week, but life got in the way. Shrewsbury's our home town and we have both here all our lives. There are lots of things to do that could in and around the town, so I'm going to stick to things that can be done all year round, basically excluding events that happen once a year (that's another post all to its self!). Shrewsbury is a town that sits in a loop of the river Severn, so the river is a significant feature of the town and an obvious place to start on this list. My favourite stretch is between the English and Welsh bridges, where you get to walk along the lower path of the quarry and take in some of the local architecture. The Quarry is a public park located close to the town centre, which hosts various events through out the year, including the Shropshire Kids Festival, The Shrewsbury Flower Show and much more. There are a number of statues in the park (if you're into that sort of thing) and a recently refurbished play park for the different age spectrums. Also locate right next to the Quarry is the main swimming pools and splash park for when the weather is good. Perhaps not for the young, but the Dingle is a floral garden situated within the Quarry. There is a maze of paths around stunning plant life, encompassing a small decorative pond in the middle, which is a nice spot to feed the ducks. This can be a contentious subject amongst the locals, with some liking them, others thinking they were a waste of money (the two main pieces were both erected shortly after the financial crash in 2007 at considerable cost to the local council). I'm a fan of 'Darwin Gate' at the top of Claremont, however 'Quantum Leap' is not so spectacular, but I'll leave you to make up your own mind. The only thing on my list that you'll encounter a charge for (although not excessive by any stretch of the imagination). The falconry centre is situated just on the north east perimeter of the town, and is located on the site of my favourite farm shop. They have plenty of birds and often take them out of their cages to show off to visitors. One of the best things about the centre is I've never seen it too busy which helps with my young son. 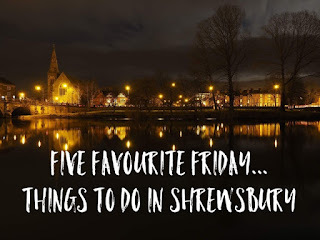 There are plenty of other things to do in and around Shrewsbury, so if your not local come and explore for yourself, if you are local, leave a comment letting me know what your favourite thing to do is. Next weeks topic will be all about Intofilms.org's 'Must See Movies Before You Grow Up', we'll be picking our favourites from their list.